Zone-Reflex: Our Universe is bubbles within bubbles? Our Universe is bubbles within bubbles? NASA's Interstellar Boundary Explorer, or IBEX, spacecraft has made it possible for scientists to construct the first comprehensive sky map of our solar system and its location in the Milky Way galaxy. The new view will change the way researchers view and study the interaction between our galaxy and sun. I copy from the site. Voyagers Journey to the Heliopause can be followd on NASAs site Science Update Visuals. It shows that just as the Earth has its magnetosphere, so have our whole solar system. See the video here. Winamp media file. Play preview animation. 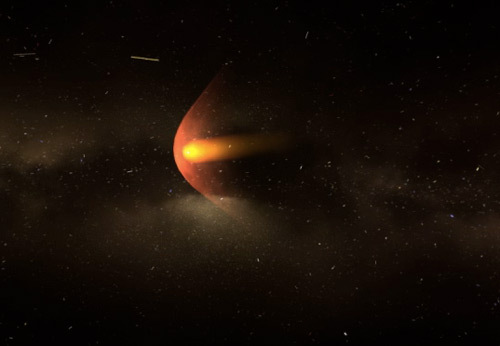 This animation starts at our sun and quickly zooms out from the solar system to reveal the heliosphere and its collision with interstellar gas. The two Voyager spacecraft are currently exploring this interaction region. 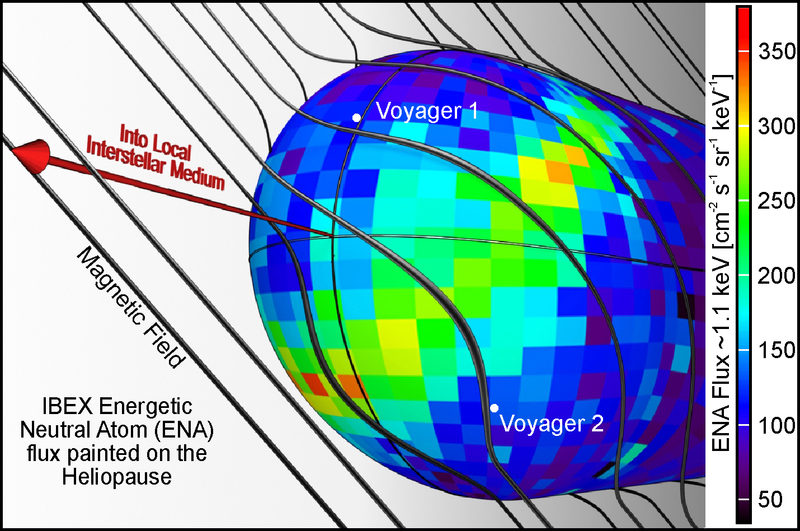 Voyagers 1 and 2 reached the termination shock in 2005 and 2007, respectively, taking point measurements as they left the solar system. Before IBEX, there was only data from these two points at the edge of the solar system. While exciting and valuable, the data they provided about this region raised more questions than they resolved. IBEX has filled in the entire interaction region, revealing surprising details completely unpredicted by any theories. IBEX completes one all-sky map every six months. IBEX completed the first map of the complex interactions occurring at the edge of the solar system (shown) this summer. Animation. 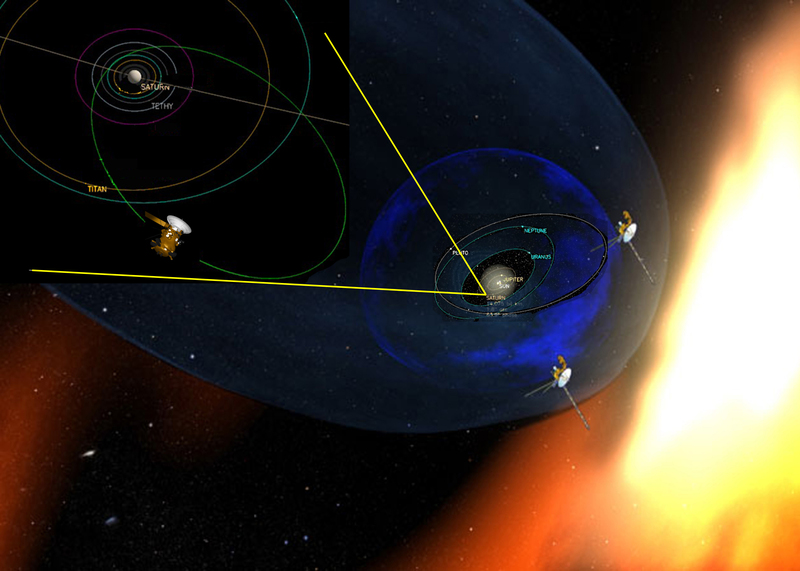 How IBEX Maps the Edge of the Heliosphere. With every spin of the spacecraft, IBEX maps out a strip of the sky, repeatedly imaging the same strip for an entire orbit. Once each orbit, IBEX is reoriented to point at the Sun, which moves the observations to a new strip. Over a six-month period, the entire sky get covered. BEX simultaneously makes a total of fourteen maps at different energies. This movie shows several different maps, with the surprising bright ribbon visible in each of them. IBEX has two independent sensors, and this still shows that they are seeing a very similar structure. The energylevel keeps the different maps apart? The Big Book a la TGD? Just as the different frequencies in the body keeps memories apart? This is also discussed by Wal Thornhill. The results, reported as a bright, winding ribbon of unknown origin which bisects the maps, have taken researchers by surprise. However, the discovery fits the electric model of stars perfectly. An auxiliary measurement made by IBEX is the detection of the interstellar gas that flows directly into the solar system. 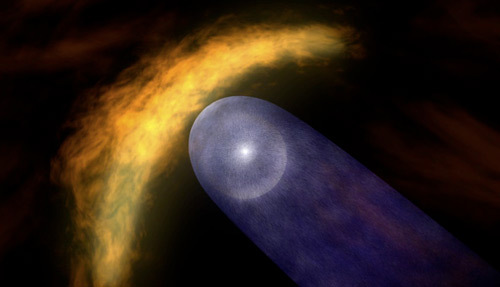 This shows the first observation of interstellar hydrogen and oxygen gas. 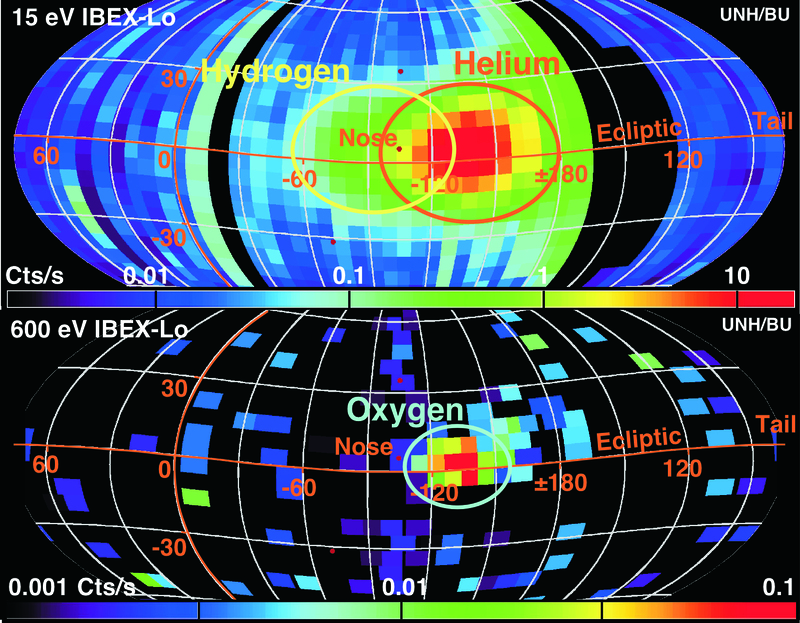 Illustrates one of the possibilities for the bright ribbon of emission seen in the IBEX ENA maps. The galactic magnetic field shapes the heliosphere as it drapes over it. 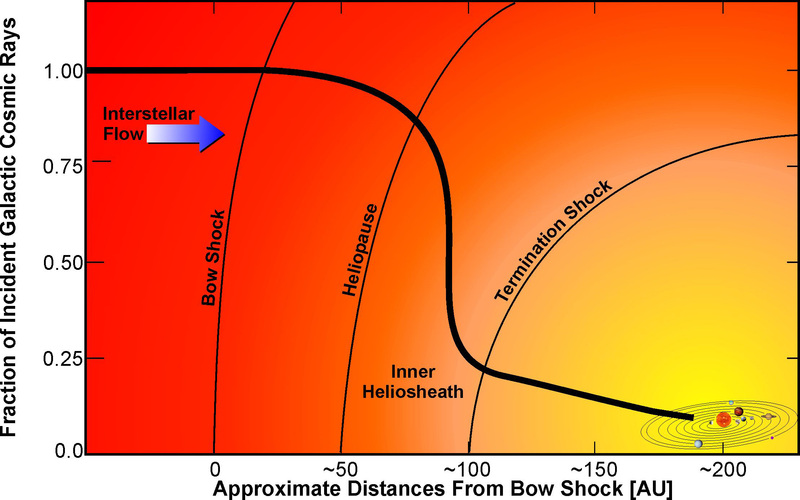 The ribbon appears to trace the area where the magnetic field is most parallel to the surface of the heliosphere (the heliopause). Astrospheres around other stars. LL Orionis, Mira, BZ Cam. This image shows photographs of the heliospheres around other stars (called astrospheres) taken by a variety of telescopes. The Sun’s movement through the Galaxy, animation. Just like all other stars in the galaxy's flattened disk, the Sun slowly orbits the center of the galaxy like a horse on a merry-go-round, taking about 250 million years to go around once, gently bobbing up and down through the disk. 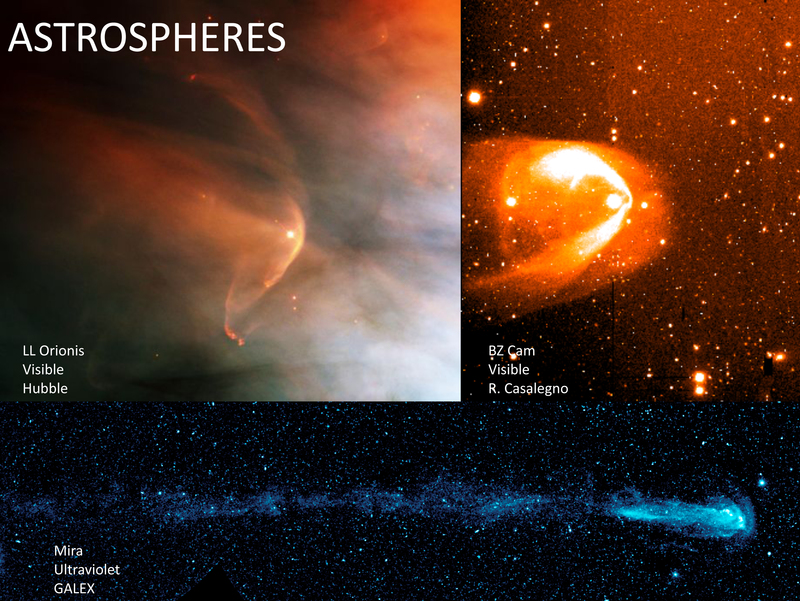 As the Solar system travels through different parts of the Milky Way, the heliosphere's shape and size keep changing. The heliosphere protects us like a cocoon as the Sun and its planets travel through the Milky Way. 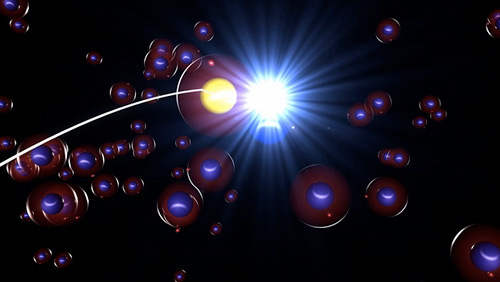 Formation of Energetic Neutral Atoms. Animation. This animation shows how Energetic Neutral Atoms are made in the heliosheath when hot solar wind protons grab an electron from a cold interstellar gas atom. The ENAs can then easily travel back into the solar system, where some are collected by IBEX. The atom that is the result ducks with the IBEX. A fanciful picture. USA behind the Haiti earthquake?? ?